Our website hosting service is provided through one of the UK's largest commercial service providers. 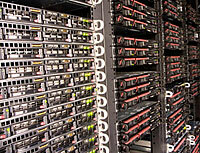 The secure data centres housing web and email servers are all UK based. Speed, capacity, bandwidth and reliability are extremely good, thus ensuring that your website be it small or large is well supported.